Wondered what happened to Evanescence? 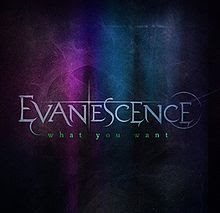 Well they are back with new track What You Want taken from their forthcoming self-titled new album due out later this year. The Pop rock band has stated that their music would be an evolution of previous works and be "better, stronger, and more interesting" Check out their new video, directed by Meiert Avis and features their fans who were playing a crowd at the bands concert. See what you think?